There's nothing worse than when I find SUPER cute top and it sells out before I can post it! RATS! 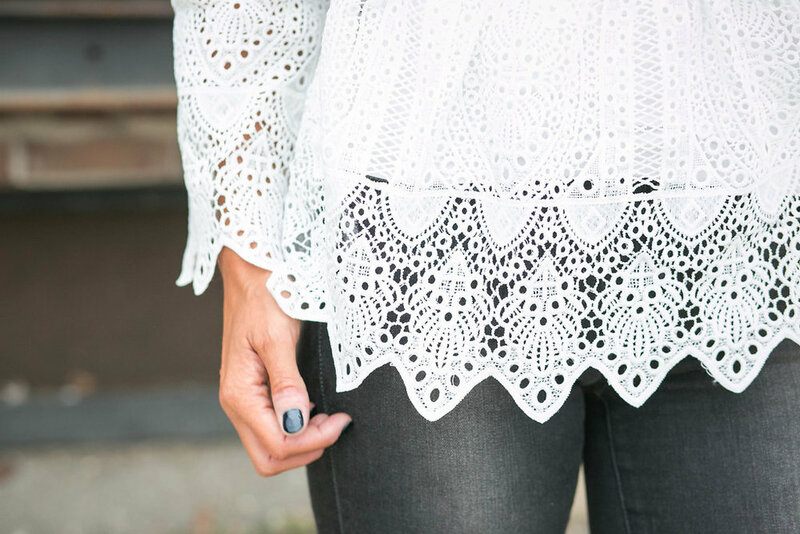 The good news is I was able to find some almost identical options that will satisfy your lace craving! I love the idea of a white top, gray jeans and a neutral shoe. As much as I love color, there's just something so classic about a neutral color palette. It never fails! Last week was a busy one for us so this week will hopefully be a little more low key except for the fact that Beckett starts school! He is sooooo excited and literally can't stop talking about it. He will go three days a week to 4 year old preschool and I think it's just the perfect amount. As much as I love the chaos of summer, Beckett thrives on routine and I'm ready for a little more scheduling. I hope everyone has a great Monday and is prepared for the week ahead!